Contemporary urban concept asserts the need to create spaces for man. However, the idea of a "man" transformed radically from the moment of its appearance. The book by the famous Danish architect and consultant in urban design Jan Gehl, "Cities for people", is a key example to demonstrate the ambiguity of this position. The book focuses on the concept of "man", which was abandoned in modernism. And modernism is criticized by the author. But in reality, it is not about the return to the "man", but about designing "new man". Gehl describes a new urban ideology, in which his understanding of "man" coincides with the postmodernist understanding of its absence. The "man" is multiple functions, actors of the city, and it refers to the bodies that are indistinguishable in their anonymity. Baudrillard, J. (2000). Prozrachnost zla [The transparancy of evil]. Moscow: Dobrosvet. Delueze, G. (1998). Logika smysla [The logic of sense]. Ekaterinburg: Delovaya kniga. Delueze, G. (2002). Kritika i klinika [Critical and clinical]. SPb. : Machina. Foucault, M. (1994). Slova i veschi. Arheologiya gumanitarnyh nauk [The order of things. An archaeology of the human sciences]. SPb. : A-cad. Gehl, J. (2012). Goroda dlya lyudey [Cities for people]. Moscow: Krost. Posohin, M. (1973). Gorod dlya cheloveka [The city for man]. Moscow: Moskva-Progress. NEVLYUTOV, Marat. The Cities for No Man. 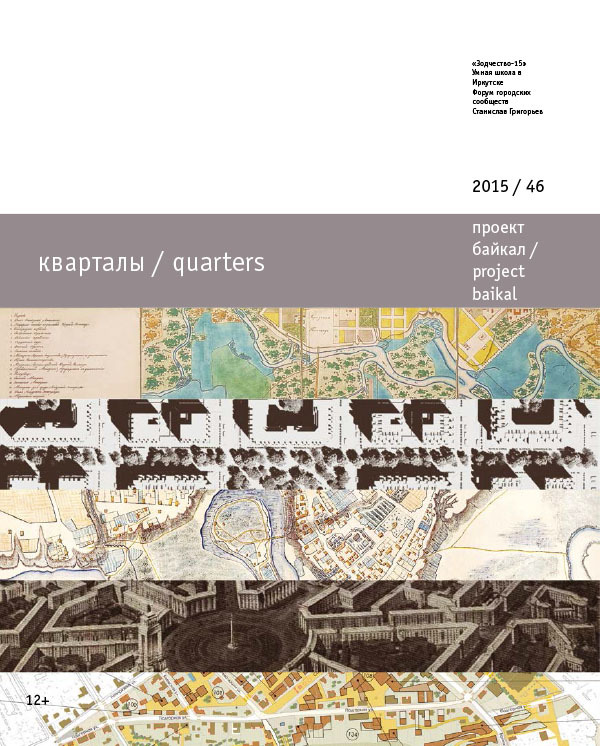 project baikal, Russian Federation, n. 46, p. 66-67, dec. 2015. ISSN 2309-3072. Available at: <http://projectbaikal.com/index.php/pb/article/view/947>. Date accessed: 23 apr. 2019. doi: https://doi.org/10.7480/projectbaikal.46.947.